There are a several sources of information for landowners on the typical terms and conditions for leasing land for wind energy development. The newest is by the Ontario Sustainable Energy Association in Canada. Landowners in Ontario now have a free and comprehensive guide on wind power in Ontario, says James Murphy, co-author of the Ontario Landowners Guide to Wind Energy. The guide provides landowners with detailed information on land option and land lease agreements. Endorsed for use by the Ontario Federation of Agriculture (OFA) and the Canadian Wind Energy Association (CanWEA), the Ontario Landowners Guide to Wind Energy is the first publication of its kind in Ontario and is the definitive source of information on wind energy for landowners. The guide is made available free of charge for download off the website of the Ontario Sustainable Energy Association at www.communitygreenpower.ca. Copies of the guide are also available from the OFA and CanWEA. The development of the guide was supported in part by the Agricultural Adaptation Council’s CanAdapt Program. OSEA is currently promoting the implementation of Standard Offer Contracts in Ontario to provide a fair, transparent and inclusive electricity procurement mechanism for farmers, businesses and co-operatives. OSEA has provided hundreds of seminars to landowners, farmers, municipalities and communities in Ontario on sustainable energy. 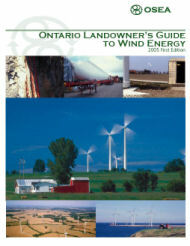 OSEA has worked on the ‘Ontario Landowners Guide to Wind Energy’ in cooperation with agricultural associations such as the Ontario Federation of Agriculture (OFA) and the National Farmers Union (NFU), our member organizations developing wind power in Ontario and with industry associations such as the Canadian Wind Energy Association (CanWEA). Part of the Ontario Landowner's Guide to Wind Energy is a Wind Energy Royalty Revenue Calculator available for download and use by landowners. Wind Energy and Wind Turbines by Vaughn Nelson, Alternative Energy Institute, West Texas A&M University, 2002, Mini-CD-ROM, US$29 including shipping and handling to Canada. To order visit www.windenergy.org/. Search for section 12.8.1 Land Owner Considerations. Much of the same information can be found by viewing the slides at www.windenergy.org/Land302_files/v3_document.htm. For a review of this CD-ROM visit www.wind-works.org/articles/sm_AEIWind.html. 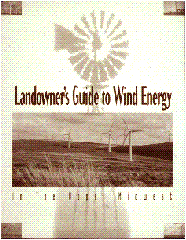 Landowner's Guide to Wind Energy In the Upper Midwest by Nancy Lange and William Grant, Izaak Walton League of America with Don Bain; Paul Gipe, Paul Gipe & Assoc. ; and Lynn Hayes, Farmers Legal Action Group. The Guide was written in the mid-1990s for farmers in Minnesota but much of the guidance still has relevance today. The Guide can be ordered from the Izaak Walton League for US$5.00. Wind Energy Easements: Legal Issues by Robert R. Nardi & John H. Daniels, Jr. Willeke & Daniels, Minneapolis, MN can be read in its entirety at www.windustry.com/opportunities/easements.htm or an 80 kB pdf file can be downloaded from www.windustry.com/opportunities/WindEasements.pdf.